RealAutoTips. - One unique part in Tokyo Motor Show 2015 is Yamaha Motobot that can drive motorcycle. This robot is the first robot that can drive the motorcycle from Yamaha innovation. Maybe it is will to be the competitor of best rider like Rossi. According Otomotif Metrotvnews (10/29/2015) that Motobot is a humanoid robot created to surpass a Valentino Rossi. 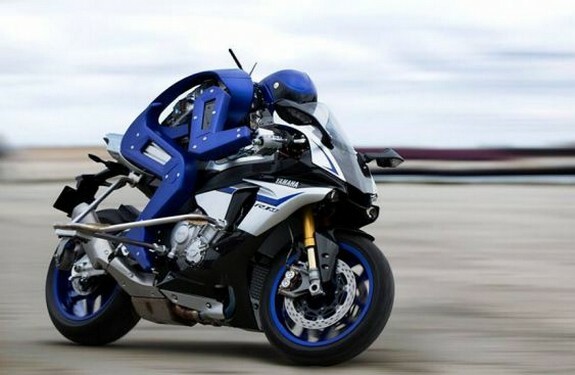 No wonder if Yamaha to design this robot riding a Yamaha YZF-R1M superbike. Motobot ver.1 is the name of this humanoid robot which has a design on the result of collaboration between divisions and robots Yamaha motorcycle. Motobot are currently in the process of development and not too perfect. The final goal of this Motobot is able to ride a motorcycle without any modification to a speed of more than 200 kilometers per hour. Of course, can only be done in any particular arena. The challenge in making these robots are regulations concerning the manufacture of robots, one of which is a robot may not injure a person. Moreover Motobot ver.1 was created for motorcycle riding. In spite of it all, Motobot ver.1 has been able to control the throttle, brake lever, clutch lever, brake pedal and transmission. Then what is the purpose of Yamaha created this robot? They said that the robot will try to research and develop the safety of the rider with the ability above average as well as a support system motorcyclists. Of course, using this Motobot.